Kolkata: There is now a new tangle in India’s land acquisition mess. State governments and civic bodies are faced with demands for taxes that were to be deducted from compensation paid by them for land acquisition under a law made effective from 1 October 2004, which most states weren’t aware of until lately. Under section 194LA of the I-T Act, state authorities acquiring “immovable assets" such as land and homes are to deduct 10% of the compensation as tax, if the amount paid to a person is more than Rs1 lakh. This law was first introduced in 1999, withdrawn in 2000, and reintroduced in 2004. The income-tax (I-T) department has so far sent notices to at least four states, including West Bengal, Chhattisgarh and Madhya Pradesh, according to a spokesperson for the Central Board of Direct Taxes (CBDT), who said these states didn’t deduct tax from the compensation paid by them for land acquisition. Though agricultural land is fully exempt from taxes, exemption cannot be claimed for all plots under cultivation. Under the definition of farmland in the I-T Act, only land situated more than 8km outside a municipal or cantonment area and in places where less than 10,000 people live is exempt from taxes. The I-T department in May sent a notice to the land acquisition officer of Howrah district in West Bengal seeking explanation for non-payment of taxes and details of people who received compensation since October 2004. Over the past five years, the state government has acquired large tracts of land in Howrah for industrial parks and a 390 acre residential project. “Howrah was a simple case —because the area is under a municipal body no land acquired there would qualify for exemption," said an I-T officer in Kolkata, who did not want to be named because he is not authorized to speak to the media. 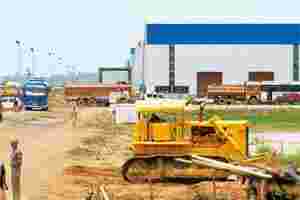 More land acquisitions in West Bengal such as in Singur, where the West Bengal government acquired 997 acres of land for Tata Motors Ltd’s small car factory, are under scrutiny. “The key issue to be determined is whether land acquired was exempt from taxes. They may not be though cultivated," he added. The CBDT spokesperson said: “Most states have complied with the provisions of Section 194LA, but compliance wasn’t 100% in any state. We are issuing notices wherever we are finding violations." The administration in West Bengal didn’t have an inkling about this law, said Roshni Sen, former district magistrate of Hooghly and South 24 Parganas. “I have acquired for the state government hundreds of acres of land in Hooghly and South 24 Parganas districts, but we never knew that tax was to be deducted from the compensation," said Sen, who is now the deputy chairman of tea board. Till date, the state hadn’t deducted tax from compensation paid for any acquisition, according to West Bengal’s land and land reforms minister Abdur Rezzak Mollah. “This would have a terrible impact," said Mollah. “There’s already tremendous resistance to land acquisition, and if on top of that farmers had to pay 10% tax, no land can ever be acquired in West Bengal." Mollah said the state government would discuss this matter internally and with the I-T department, and “if at all any tax has to be paid, it should be paid by the administration and not by those from whom land has been acquired". Official spokespersons of Madhya Pradesh and Chhattisgarh governments said they weren’t aware of the I-T department’s notice. Deducting tax from compensation for land acquisition is “absurd", said Sebastian Morris, a professor of Indian Institute of Management, Ahmedabad, and an expert on land acquisition. “Because the transaction is being forced on the farmer, no tax should be levied either on account of income or capital gains," he added. “There is nothing unusual in land acquisitions being brought under TDS (tax deducted at source) net," said barrister Abhrajit Mitra. “TDS net is being widened every year… The state government should have been advised by its lawyers about this law. There’s no point saying ‘we didn’t know’."